Social media isn’t just for personal use anymore. It has become another way for businesses and consumers to come together. And seeing though people tend to spend almost 2 hours every day on social media, you probably want your business to have some sort of presence. Some businesses tend to steer clear of social media because they don’t really understand how to use it, or the benefits it provides. 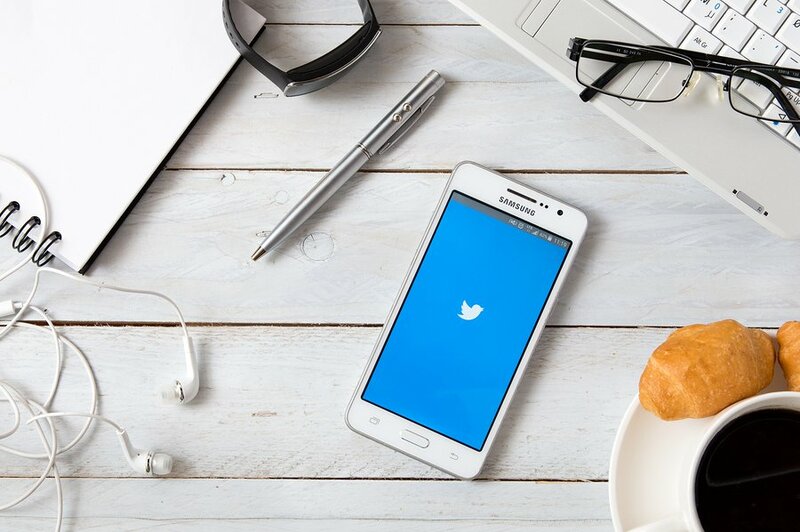 If you don’t think social media has any benefits for your business, have a read of the blog I wrote about “The Benefits of Social Media Marketing for Businesses”. It will hopefully change your mind! Yes, developing a social media strategy (and actually sticking to it) can be difficult at the best of times. But surely this is a sacrifice you are willing to make and the positives completely outweigh the negatives. 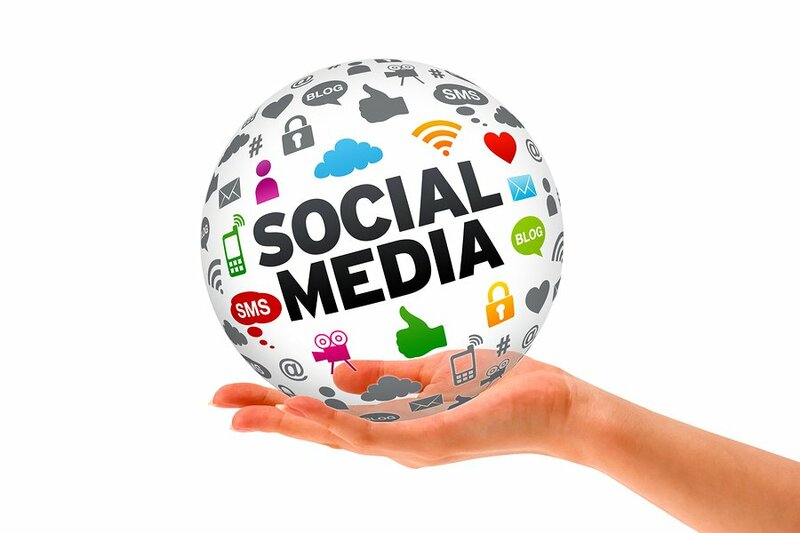 You are probably aware that there are a variety of different social media platforms. Each with their own features and users expect something different from every different platform. This is where it gets a bit tricky. Because users expect a different kind of content and post on each different platform, you can’t standardise your posts. Every platform you use, you should be customising posts. For the purpose of this blog, I will be focussing on 3 social media platforms; Facebook, Twitter and Instagram. 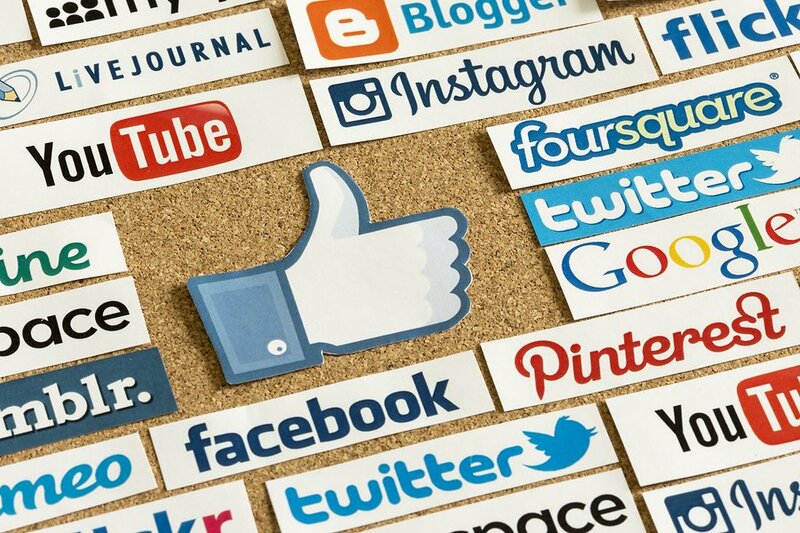 These should be the social media platforms your business is on. You shouldn’t have too many different accounts because it will become much harder to manage. Try to stick to only 2 or 3 different platforms. Each social media platform has a slightly varied user demographic. Make sure you do your research and match up with the platforms that have the most similar user demographics to your target market. That being said pretty much everyone uses social media! So no matter the platform you choose, you are bound to reach at least a portion of your target market. Content creation is hard and may take a bit of time to understand what works best for what platform. But lucky for you, I am here to help! You can skip all that content creation trial and error and I can give you some tips to help create the best post for Facebook, Twitter and Instagram. Note: Obviously every business is different, the tips I am providing are general overviews of what has been proven to work well currently and in the past . As well as this, social media is ever-evolving. This means that something that works well now, may not in the future. 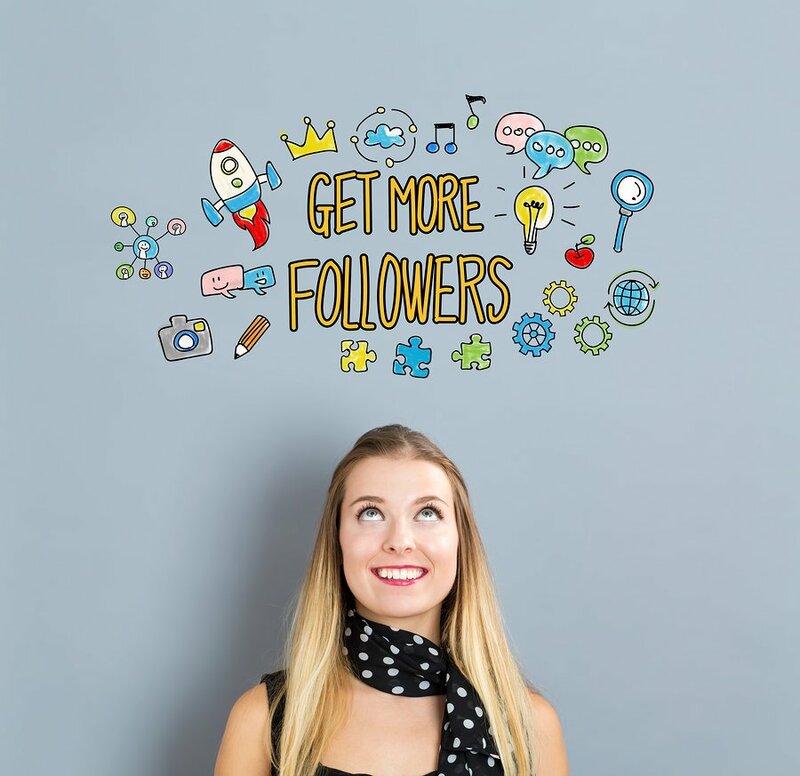 There is one key to unlocking higher levels of engagement, more followers, etc. and that is amazing content (i.e. posts). You will need to create perfect posts for each social media account. As I said before, all social media platforms have some differences. This means you should also tailor your post depending on the platform. This includes components such as character limits, picture quality, hashtags, emojis etc. It will take you longer to tailor your posts for different platforms but it will certainly be worth it. 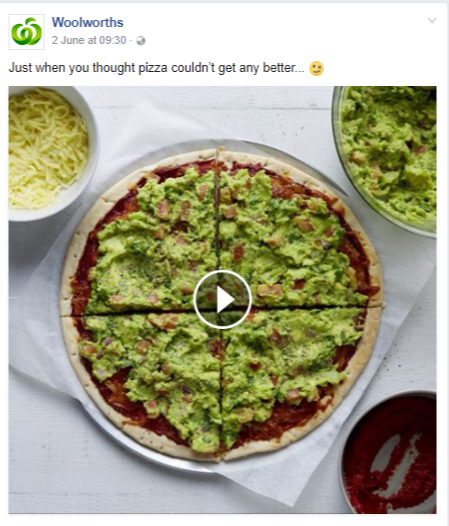 Research from Buffer Social has picked up on the trend that successful brands on social media are always changing their post between the platforms; this includes brands like Nike, McDonalds and Dominos. Now I know that you probably don’t have the same amount of resources as these majors brands. Therefore you should start slow on social media, only posting once or twice. Then you can gradually build up your presence. When you start to see the positive results you will understand that it’s worth it. Facebook is probably one of the most widely used social media platforms. Facebook has almost reached 2 billion daily active users. Think about that, there are about 7.5 billion people on Earth. This means that about a quarter of the population use Facebook EVERYDAY. This number is only expected to grow and there are 5 new profiles created every second. Every now and then you should ask your followers a question. Questions encourage higher levels of engagement in terms of comments. It helps to spark a discussion between you and your followers, and even between your different followers. It is important to ensure that if a follower comments on your post, you reply to it. This will encourage further engagement and shows that you actually care about what people have to say. 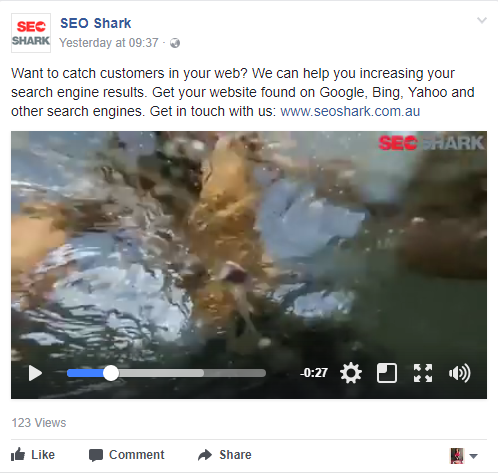 In this post we asked “Want to catch customers in your web?”. This encourages our followers to stop and think about what they want to do. If they do indeed want to get more customers, the post explains that we can help them. Questions in general create more interest and asking questions is a must on Facebook if you want to get people engaged. The great thing about questions is it has the ability to turn a bland status into an appealing one. Out of Twitter and Instagram, Facebook has the largest character limit by far. When you have more words to play with, you should certainly give it a try. Find out what post length works for you. You should always try to vary the length of your post, some days they may be quite short and others longer. However, it is important to remember that when on social media, users tend to enjoy and engage more with the shorter posts. If you post is deemed too long, people may not read it or get bored half way through and stop reading. To create engaging posts you should keep it short enough. Don’t go writing “War and Peace” on your Facebook profile! 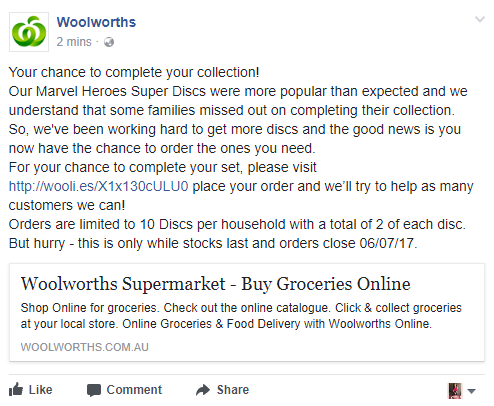 Woolworths experiments with the length of their Facebook posts. Sometimes they go into more detail and in others they just include a few words. Research conducted by Hubspot found that a simple emoji can increase your amount of post likes by more than 50%, your comments and shares by more than 30%. That is a lot of positive coming from one little emoji! There are so many different emojis you can choose from. No matter want you are talking about in your post, you are sure to find an emoji that will match. Most of the time a simple smiley face is acceptable. 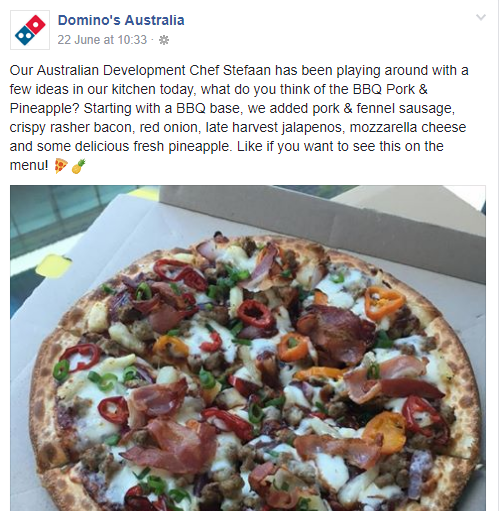 Dominos is a great example of a brand that uses emojis all the time. No prizes for guessing the emoji they always use! Twitter is popular way of sharing short and simple messages with your followers. Twitter doesn’t quite have the same amount of daily users as Facebook, but they still see 100 million users every day. Twitter tends to be used by the older demographics; with 18 to 49 year olds making up 62% of total twitter users. Hashtags are important for Twitter. However, I see far too many people getting sucked into the hashtag trap. They either include too many hashtags or use hashtags that aren’t necessarily relevant to their post. 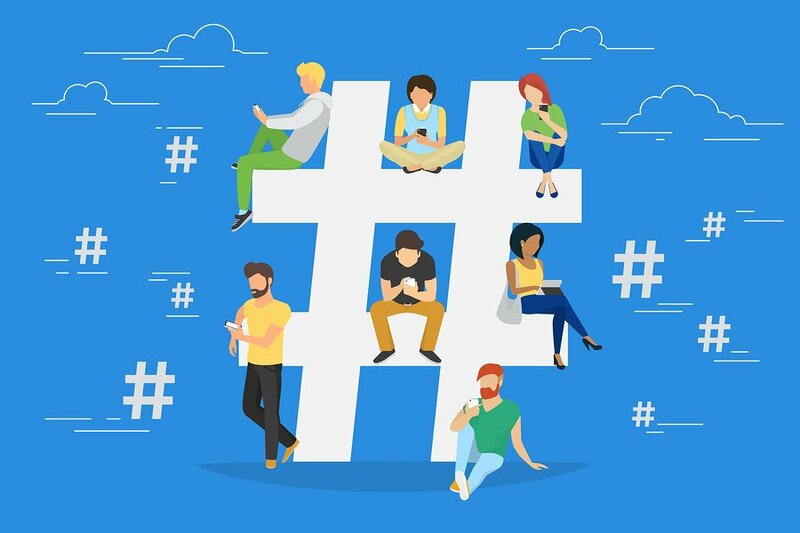 Some people think that the more hashtags you include, the more engaging the post will be. This isn’t always the case and including too many hashtags can dilute your message. Your hashtag must serve a purpose. For example, if you want your hashtags to help increase your reach or boost engagement then look towards more generalised terms. A good number of hashtags would probably be from 1 to 3. That way you are getting your message across and ensuring more people have the potential to read it. Any more than 3 and you are probably just wasting your time. 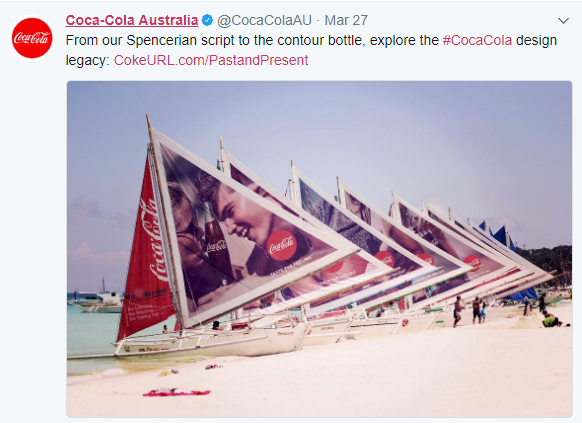 On Coca Cola Australia’s Twitter page they are commonly posting with 1 or 2 hashtags. Their hashtag “#CocaCola” is clearly relevant to the brand. When a user types “#CocaCola” into the Twitter search bar, all the posts made with that hashtag will be displayed. The character limit for Twitter is considerably smaller than most other social media platforms, sitting at just 140. However, this doesn’t mean that you should use all the characters.Twitter is all about fast and sharp messages, so try to keep a tight rein on your character usage. The shorter the Tweet, the greater the impact. Buddy Media explains that Tweets less than 100 characters get almost 20% more engagement then longer Tweets. Twitter is the place for a quick and simple message. Twitter made a fairly recent change in terms of pictures and character limits. Before, if you wanted to use a picture it would take up some of your characters. Now any image does not impact your character limit. Therefore you should be more inclined to include images in your Twitter posts. Most Twitter users are looking for new and interesting information and articles. This means if you are sharing a new piece of work ensure you explicitly let your followers know that it is new. Users love real time news and information. So by explaining that what you have is new they are more likely to be engaged. 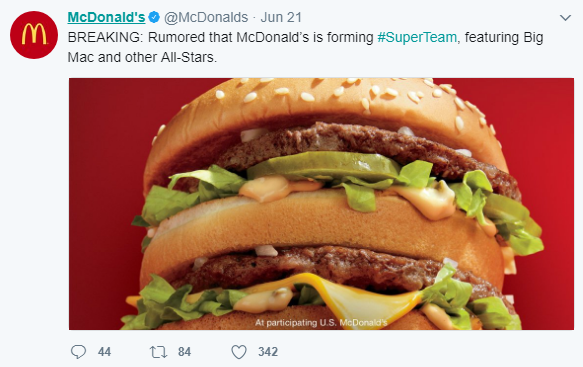 McDonalds is a perfect example of a brand that creates engagement and excitement by introducing new products etc. on their Twitter account. They are constantly using attention-grabbing words such as “breaking”, “just now” and “best news ever”. Instagram is probably one of the newest social media platforms. But don’t let its age fool you; it is still one of the most powerful social platforms (it is under the wing of Facebook). 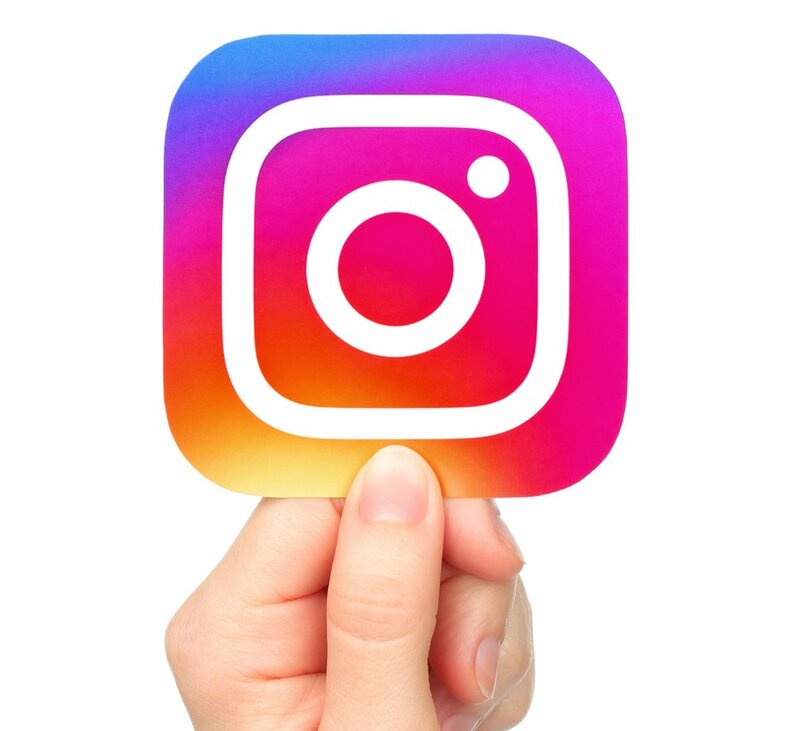 Instagram has about 400 million active daily users. Hashtags are probably most prevalent on Instagram. They allow users to find more content as well as discover great accounts to follow. Simply Measured found that posts with at least one hashtag see about 12% more engagement than posts with no hashtags. You can literally hashtag anything. It is important that you experiment with hashtags to help you get the best outcome. On Instagram you are allowed a limit of 30 hashtags. You should try to break up the hashtags used on your post between specific and more generalised. 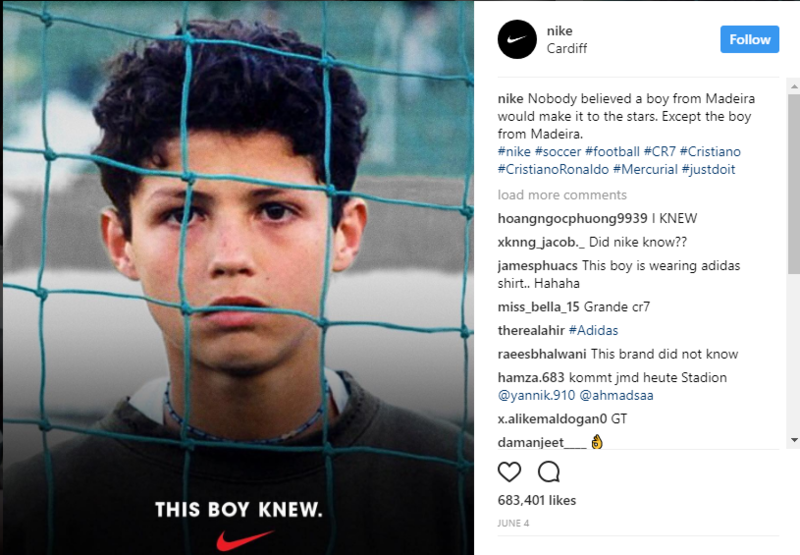 Nike used hashtags very effectively. In the post seen below they use 8 hashtags. They mix it up with specific ones like “#CristianoRonaldo” and general ones like “soccer”. This way they are appealing to the greatest, most diverse audience possible. On Instagram there is a character limit of 2,200. However you shouldn’t write that much in your post. After 3 lines of text a […] appears. As a rule of thumb, you should try to never have the ellipsis appear. It is important that your post is short enough for everyone to see its entirety. 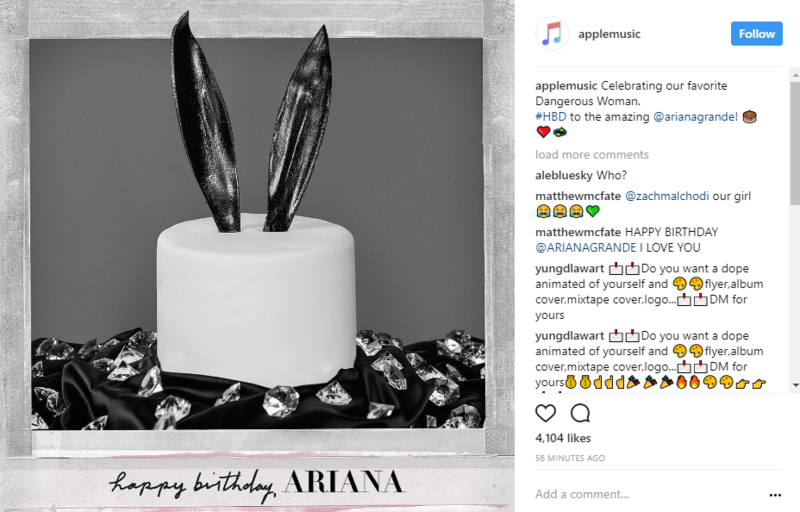 Captions aren't always as important as the image on Instagram, but your caption should constantly be grabbing your readers attention and encouraging them to like the post and follow your account. You should always include posts that encourage users to reply. This is one of the best ways to ensure an increase in your engagement. Instagram users tend to be fairly vocal, they don’t need much encouragement before they start to voice their opinion! Encouraging replies could include asking your followers a question. 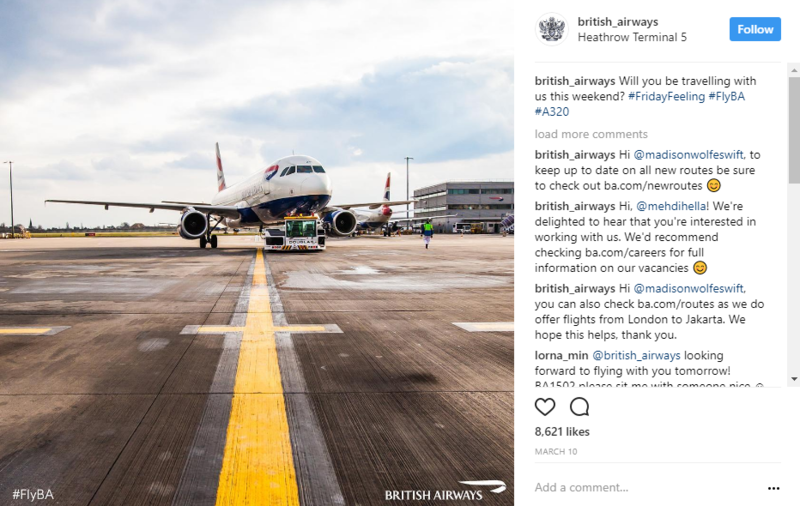 British Airways always ask questions in their posts. It encourages users to think more about a particular topic. Or even running an Instagram competition meaning they have to like, comment (tag a friend), follow, etc. to be in the chance is win a prize. 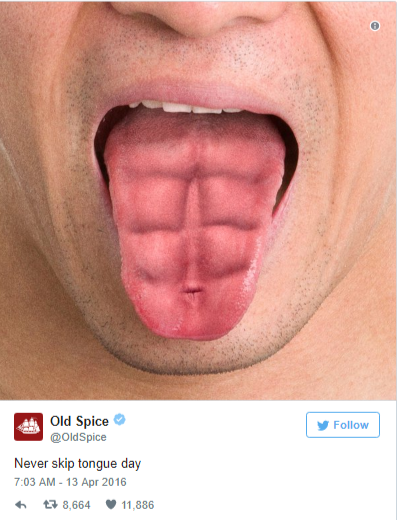 More and more brands are coming on board with this idea. 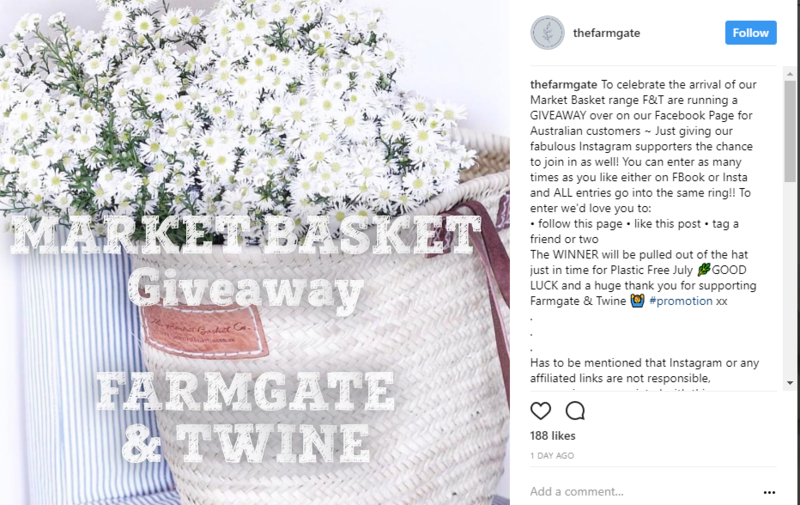 Farmgate and Twine are currently running a competition, and to be in the draw to win you have to tag a friend (i.e. comment on the post), etc. Every social media platform you use will require different content. It can sometimes be difficult to create unique content for each platform, that’s why I wrote this blog! Hopefully the tips in this blog make it a lot easier to produce the perfect post for Facebook, Twitter and Instagram. The above tips are quick changes you can make to ensure your social media account is filled with unique content. Each platform has different features and requirements. If you want to create higher levels of engagement and followers, etc. it is important for you to tailor posts to each platform. Yes, this may mean more time spent creating content, but I can assure you that is it completely worth it in the long run.